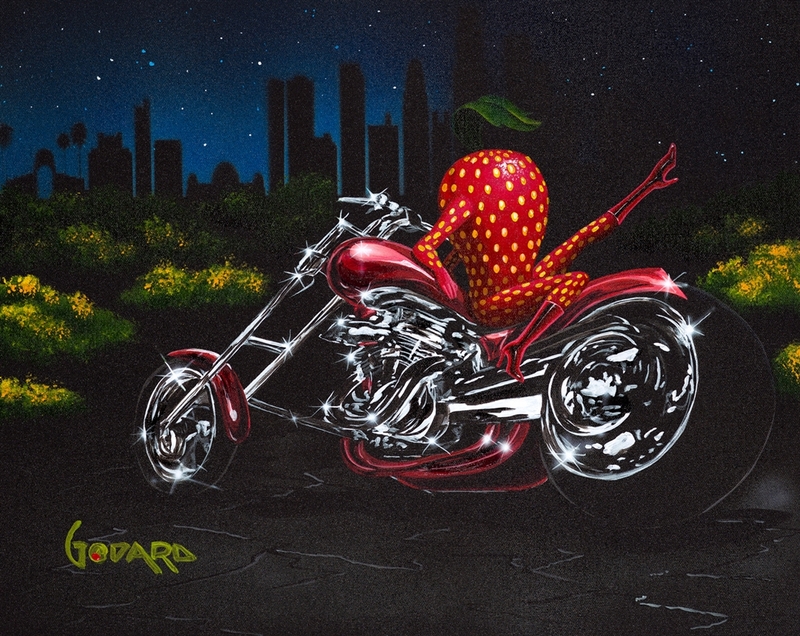 “Rockstar of the Art World” Michael Godard captivates viewers with his animated olives,whimsical grapes, and dancing strawberries. 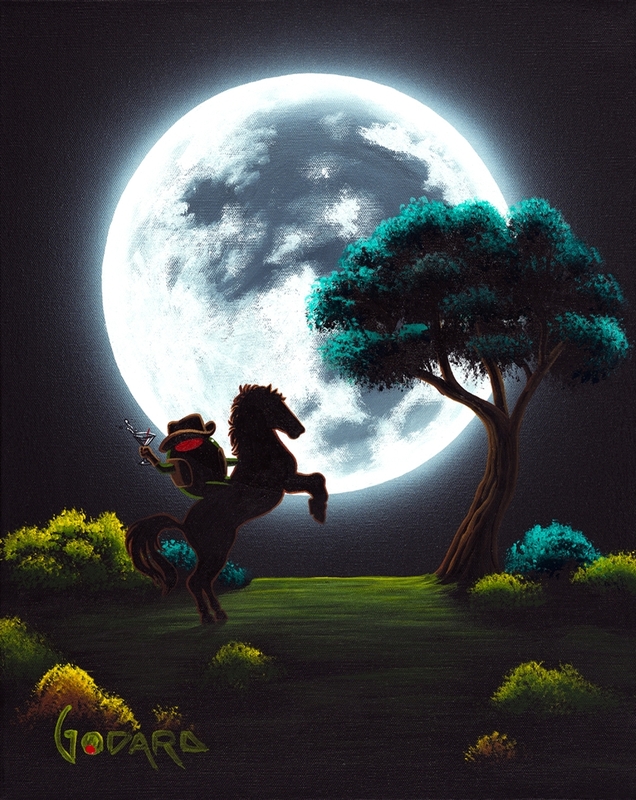 He redefines art with quirky imagery that combines imagination with humor. 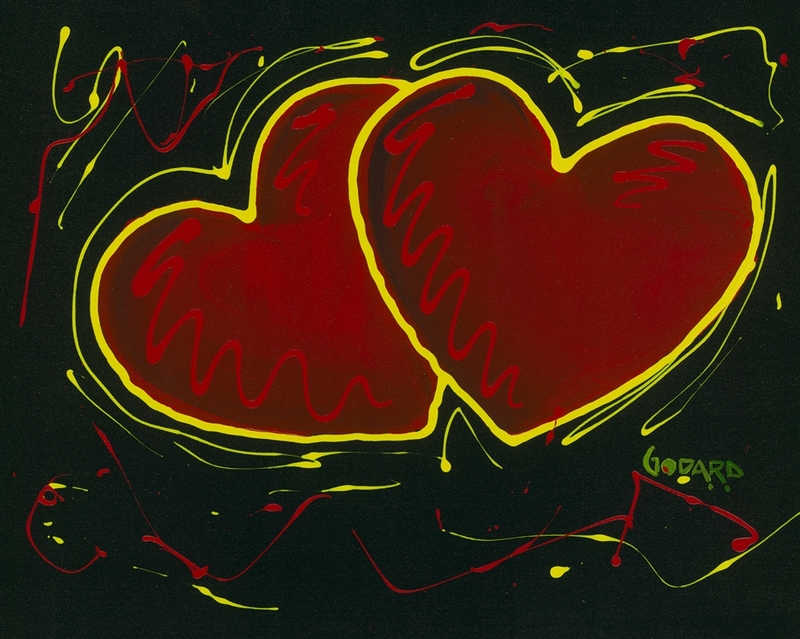 Godard’s artwork has been shown and collected all over the world. His artwork is on permanent display in the Officer’s Lounge in the Pentagon and on board every U.S. Navy aircraft carrier. Godard is an active philanthropist and has been honored by St. Jude Children’s Research Hospital for his dedication to fighting childhood cancer. Michael Godard discovered his talent for art at an early age. The young artist used his drawing skills as a way to make new friends. Godard spent most of his high school and college years living in Las Vegas. After attending college in Las Vegas, Godard worked as a mechanical engineer for 12 years before diving into his art career. In 2006, Godard lost his 16-year-old daughter to brain cancer. The artist now dedicates his life’s work to helping families fighting cancer by working closely with St. Jude Children’s Research Hospital. Godard works closely with The Sharon Osbourne Colon Cancer Program, The Make-A-Wish Foundation, and the Nevada Cancer Institute. The artist also supports military organizations like the Wounded Warrior Project and Fallen Heroes Project. Michael Godard’s spectrum of artwork ranges from highly-detailed paintings to loose, colorful Pop Art. His playful subjects are often portrayed dancing around a cocktail or glass of wine, falling in love, and getting into trouble. Godard acknowledges his brand might not appeal to everyone, but believes humor is a universal language. “Every painting might not be for every person, but everyone, I think, loves to have a laugh,” Godard says. Godard invented his signature olive character after a friend requested a painting of a dirty martini for his birthday. Godard painted his friend’s request with a twist and brought a pair of olives to life. While his characters are unconventional, Godard embraces the challenge of giving personalities to inanimate objects. Although Godard’s whimsical paintings are far removed from reality, the artist hides secret ties to the real world within his art. Godard says he’s modeled his silly characters after friends or people he’s met at art auctions. If the viewer looks closely, they’ll also find hidden details like names, dates, or initials scattered throughout Godard’s artwork. “The paintings are like a humorous, emotional bath,” he says. Godard’s artwork centers around several themes all pointing back to the artist’s Vegas roots. Many of Godard’s characters are seen playing a round of golf, a nod to Godard’s years of living on Las Vegas golf courses. Godard’s olives are also portrayed gambling—a signature Vegas pastime as well as a tribute to Godard’s love of math. Alcohol is also a common theme throughout Godard’s work. 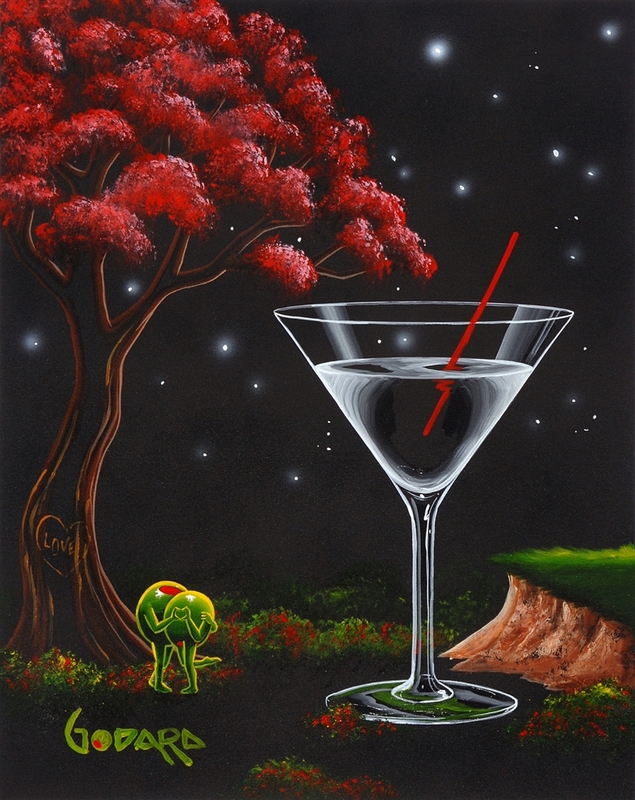 Although the artist says he is not a heavy drinker, he embraces the social side of alcohol to bring people together. 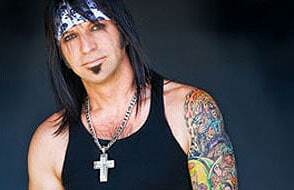 Godard appeared on A&E’s “Criss Angel’s Mindfreak” and during the Biography Channel’s Criss Angel segment. A documentary on Michael Godard’s life won several awards and was aired at multiple independent film festivals. In March of 2011, a slot game called “Godard’s Rockin’ Olives™ Video Slot” by Aristocrat Technologies made its debut at the San Manuel Indian Bingo & Casino on March 22, 2011. Each frame and image in the Rockin’ Olives machine was hand-painted by Godard. In 2013, Godard created his own brands of gin and vodka with his artwork adorning the bottles. Jude Children’s Research Hospital honored Godard for his dedication to fighting childhood cancer at the 7th Annual St. Jude: Affair of the Art Gala on May 6, 2017, in Las Vegas.